Scales: G s, A s and A.
Scales: C s, D s and D.
Your Home Assistant for Tanpura and Tabla. Above Titles are Computer Based Interactive Programs. Riyaz Swar Taal. Part 1 and Part 2. In Indian Classical Music, Performing artists either experienced professionals or learners, to gain and maintain mastery over it, need continuous day to day Practice, i.e. what is called as Riyaz. Swar and Tal are the main important Pillars of any Musical Learning Process. Knowledge of tuning and assistance to play these instruments, along with time and mood, are the other needs which put forth many limitations to this Riyaz e.g. Artist has to do his or her riyaz in accordance with the convenience and the time given by the assistance. Here in Riyaz Swar - Tal, it has been tried to overcome all these limitations. 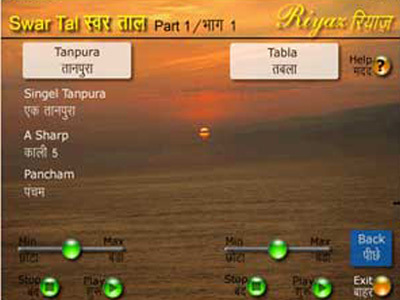 Riyaz Swar - Tal, is a first ever computer based program, in which we have provided Pretuned both Swar and Tal, in standard major scales. Pretuned Tanpura option is available in 2 categories - Single Tanpura and Double Tanpura i.e. also known as Jod Tanpura, it is further available in three standard Swars- Pancham, Madhyam, and Nishad. In any option and in any Swar, Tanpura is available in 3 laya [ i.e. speed ] Slow, Medium and High speed, Which, on play, gives almost a live feel. 23 taals are given in Riyaz Swar - Tal, in different laya forms [ pre - tuned to major standard scales ]. These laya's are categorized in 3 different forms - i.e. Vilambit laya, Madhya laya and Drut laya, depending upon taal. Wherever catagory is not required, they are given in rising order of speed [ or tempo ] i.e. from slow to fast. Due to the practical consideration in approach, it has been tried to cover maximum types of laya, which one normally requires in Riyaz. Thus, the need of tuning and playing Tabla Instrument, is absolutely avoided. 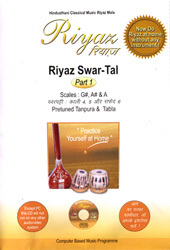 The purpose of Riyaz Swar - Tal, is to help learners, to make their Riyaz totally independent. 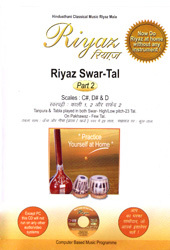 Riyaz Swar - Tal, is given in Interactive CD - Rom format and scale wise divided into 2 Parts. Swar Tal. Part 1. Scale: G Sharp [ Kali 4 ], A Sharp [ Kali 5 ], A [ Saphed 6 ]. Swar Tal. Part 2. Scale: C Sharp [ Kali 1 ], D Sharp[ Kali 2 ], D [ Saphed 2 ]. Unique Feature of Part 1 and Part 2. Pitched [ Taar Swar ] and low pitched [ Kharja Swar ] some of them are made available on Pakhawaj. Thus, Riyaz Swar - Tal, is a modern simple device. It can be operated easily by any artist at any stage of learning. This device, therefore, will help to make Riyaz absolutely independent. ● Separate Volume Control for Tanpura and Tabla. ● Very useful for Riyaz of other music like semi classical, light music.